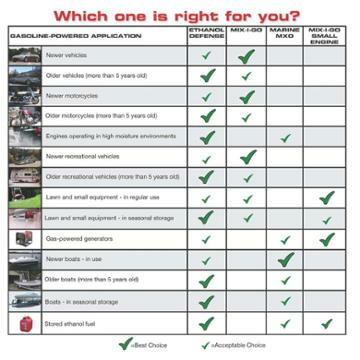 Check out this chart to help you choose the best product for your application (click to enlarge). The products that started the fuel additive industry! Bell Performance gasoline treatments are the best on the market to improve gasoline and solve the fuel-related engine problems inherent to these fuels. Try proven fuel treatments from Bell Performance to solve ethanol problems in all types of gasoline engines, large and small.